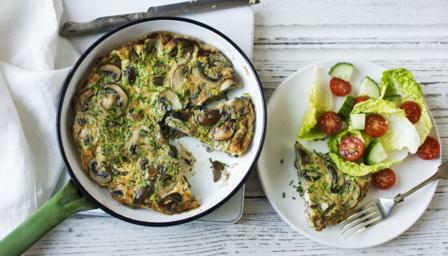 Garlic and mushrooms bring great flavour to this super-low-calorie, easy-to-make frittata. Serve with salad for a simple and delicious lunch. This meal provides 243 kcal per portion. Return all the mushrooms to the pan and stir in the garlic and chives, a pinch of salt and plenty of ground black pepper. Cook for a further minute, then reduce the heat to low.